Laticrete is a world-wide manufacturer and industry leader in innovative building products for residential, commercial, and industrial applications. 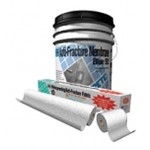 Laticrete products include premium thinsets, waterproofing membranes, adhesives, and grouts. In addition to carrying Laticrete's stone and tile building materials, we are also proud offer Laticrete's complete line of Hydro Ban products including the Laticrete Preformed Shower System. Fracture Ban SC is a thin, load bearing, self-curing liquid rubber polymer that can be easily applied in a single coat to form a flexible seamless anti-fracture membrane. Sale price good through 4/30. Laticrete Tri-Lite Thin­Set is a lightweight, high performance tri-purpose mortar designed for large and heavy tile, thin-bed and wall installations. Sale price on 30 lb bag, White, good through 4/30. 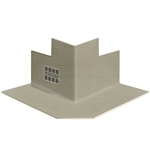 Laticrete 170 Sound & Crack Isolation Mat is a high performance acoustical underlayment system that muffles impact noises through ceramic tiles, stone and other hard surfacing materials. Designed for use with Laticrete 500/600 Series Grout, Laticrete 1776 Grout Admix Plus with Anti-Microbial Protection is used in place of water to provide a dense, more colorfast grout joint that inhibits stain causing bacteria, mold and mildew growth with anti-microbial protection. Laticrete 1776 Grout Admix Plus, 64oz. Designed for use with Laticrete 1500/1600 Series Grout, Laticrete 1776 Grout Admix Plus with Anti-Microbial Protection is used in place of water to provide a dense, more colorfast grout joint that inhibits stain causing bacteria, mold and mildew growth with anti-microbial protection. Laticrete 220 Marble & Granite-White is a fortified dry-set mortar specifically formulated to provide a one-step installation for large format ceramic tile, marble and stone, including ungauged tiles or installing tiles on a rough surface. 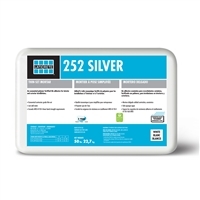 Laticrete 252 Silver is an economical polymer modified, bagged, cementitious thin-set powder to be mixed only with water using the thin-set method of installation. Laticrete 253 Gold is an economical polymer modified, bagged, cementitious thin-set powder to be mixed only with water using the thin-set method of installation. Laticrete 255 MultiMax- Gray is a patented, versatile polymer modified thin-set that provides maximum non-sag performance on walls, maximum build up of up to 3/4" (18 mm) without shrinkage for floors and maximum coverage due to its lightweight creamy smooth consistency. 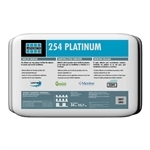 Laticrete 255 MultiMax- White is a patented, versatile polymer modified thin-set that provides maximum non-sag performance on walls, maximum build up of up to 3/4" (18 mm) without shrinkage for floors and maximum coverage due to its lightweight creamy smooth consistency. Laticrete 272 Mortar is a high performance bagged cementitious powder to be mixed with either water or latex admixture to install ceramic tile and stone using the thin-set method of installation. Designed for interior or exterior installation of ceramic tile and stone for walls and floors. Laticrete 317 thinset- White is a bagged cementitious powder. Laticrete 317 Thinset- Gray is a bagged cementitious powder. It is mixed with either water or latex admixture for installing ceramic tile and stone using the thin-set method of installation. Laticrete 333 Admix 5 Gal. Laticrete 333 Super Flexible Additive is an extraordinarily flexible latex additive for use with thin set mortars and other cement mixes. Fortified Mortar Bed is a polymer fortified blend of carefully selected polymers, portland cement and graded aggregates. 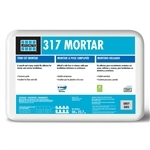 3701 Fortified Mortar Bed does not require the use of latex admix, you only need to add water to produce thick bed mortar with exceptional strength. Laticrete 3701 Mortar Admix is a specially designed latex admixture for use with thin-set mortars, cement grouts, cement mortar beds, and other cement mixes. Laticrete® 4-XLT is a multi-use, polymer fortified adhesive mortar offering tremendous utility including non-sag wall installations, medium bed build up of up to 3/4" (19 mm) and thin-set applications on floors. Laticrete Admix & Primer is a latex primer for use with Laticrete 86 LatiLevel and Laticrete 88 LatiLevel. 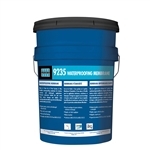 Laticrete 9235 Waterproofing Membrane is a thin, load-bearing waterproofing designed specifically for the special requirements of ceramic tile, stone and brick installations. Laticrete Admix 4237, 5 gal. Laticrete 4237 Latex Additive produces a high strength adhesive that is frost, weather and shock resistant. Laticrete Blue 92 Anti-Fracture Membrane is a two–part system consisting of a liquid rubber and reinforcing fabric. Laticrete Glass Tile Adhesive, 25 lbs. Laticrete Glass Tile Adhesive is a one-step, non-sag, polymer fortified adhesive mortar that is specifically formulated for use in glass tile applications. Laticrete Hydro Ban Adhesive & Sealant is a one component, fast curing, hybrid elastomeric adhesive and sealant. Laticrete Hydro Ban is a thin, load bearing waterproofing/crack isolation membrane that DOES NOT require the use of fabric in the field, coves or corners.